Upon their long overdue return to Pueblo Nuevo, a new-look Vinotinto gained a credible point against their qualification-chasing neighbours. Though at times it could be a bitty affair with the referee’s whistle frequently heard, Rafael Dudamel’s youthful side displayed admirable intent and tenacity to deny Colombia the two additional points they desired. In turn, José Pékerman’s 2nd-placed men often lacked attacking fluency, something which has been a consistent problem in their campaign as in their 15 games they have scored only 18 goals – just one more than bottom-placed Venezuela. 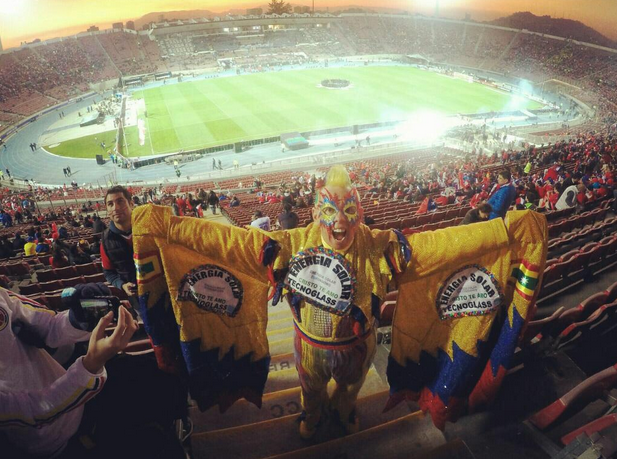 Perhaps unsurprisingly then, much of the first half played in the politically contentious border state of Táchira – anti-government chants were heard and fan signs were assessed upon entry – was an ugly affair, with 26 fouls committed (the highest so far in this CONMEBOL qualifying cycle). 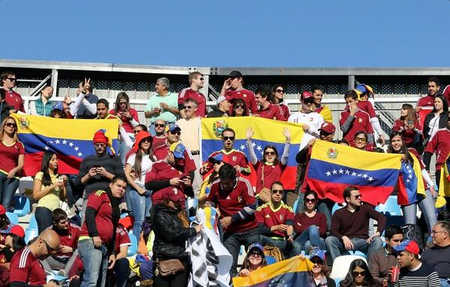 Very few attempts on goal were made in the opening half, though given Venezuela’s porous defence (34 conceded) and the number of personnel alterations made, this could only be seen as encouraging for the Qatar 2022-dreaming hosts. Soon after the half-hour mark, however, this changed, with one of the prospective leading lights of the next qualifying campaign called into action. 19-year-old goalkeeper Wuilker Fariñez – a star throughout the U20 side’s remarkable run to the World Cup final in June – pulled off the first few of what were to be several noteworthy stops. The first was the best of the lot, with Radamel Falcao’s powerful nine-yard header in space from a left-sided cross superbly blocked with an equally strong glove. Subsequently, virtually on the goal-line, centre-back Mikel Villanueva did well to hook the rebound away from an opponent. 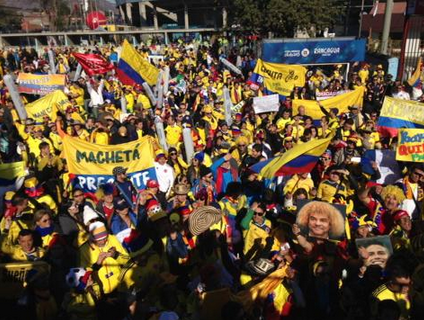 As much as jolt the Venezuelan back-line, this shook the game into life. Shortly afterwards in the 35th minute at the other end, seemingly out of nothing, Josef Martínez received a long ball on the centre-left, came inside and rattled the crossbar with a spectacular right-footed 25-yard shot. In an immediate response, the action returned to Fariñez’s domain, with a corner being struck on the low volley by Carlos Sánchez and going only narrowly wide – though the Caracas FC goalkeeper appeared to have it covered. A minute later, 26-year-old Yimmi Chará – playing his first-ever competitive international – latched onto a ball on the right edge of the area, firing a low, well-struck effort which Fariñez was alert to, blocking and then collecting. At this point, it did seem that if the hosts were to score, a goal was most likely to arrive following something sensational á la Martínez’s effort and/or a set-piece. Hitherto, captain Tomás Rincón, not typically the first-choice free-kick taker, had little joy with his dead-balls but as the half drew to a close, he floated in a fine, direct chip from some 45 yards. This found towering centre-back Jhon Chancellor in space, who rose well and quite possibly should have opened the scoring. Alas, instead his header went just inches wide of the far post and the two sides went into the interval level. After the restart, Colombia had a similar opportunity in the 52nd minute when Edwin Cardona’s free-kick was headed by the central Falcao, albeit straight into the grateful arms of Fariñez. Five minutes later, Venezuela were gifted a chance when a long ball from the left was meekly passed back towards his own goalkeeper by Colombian Cristian Zapata. Criminally, it was too short and Salomón Rondón pounced, though from an acute angle inside the area, the striker could only manage a low attempt which David Ospina saved for a corner. With the game opening up, Fariñez had to be increasingly attentive to play, something that he proved to be more than capable of. Indeed, just 24 seconds after the restart he did well to block a low Juan Cuadrado strike at his near post and, throughout the half, was quick to race off his line to intercept long balls and dangerous crosses. More than one of these came from the tricky left-sided wide man Chará, who in the 64th minute looked as if he was going to blitz the back of the Venezuelan net. Here on his flank, he picked up an exquisite, pinpoint ball, swiftly raced past his man into the area, before cutting over to his right boot. Yet, with home fans inhaling their breath and fearing the worst, he blazed his strike well over the bar, squandering one of the best opportunities of the match. Up the other end, for the first 20-25 minutes of the second half, Venezuela’s chances were largely long-range efforts, such as a 69th minute attempt from U20 World Cup captain Yangel Herrera and a similar, earlier strike from his senior counterpart, Rincón. Neither of these caused too much trouble for Ospina, less so a 68th-minute effort from substitute Jhon Murillo, which went far over the bar from the left edge of the area. However unremarkable this particular attempt may have been, plenty were on the edges of their seats to appreciate the build-up play of Venezuela’s U20 World Cup top scorer Sergio Córdova, who held off three players as he roamed infield from the right before making the pass. This was one of a few eye-catching, positive attacking moments from the Augsburg man, in what was his senior international debut. Murillo may not have covered himself with glory in the aforementioned move, but the Turkey-based attacker soon atoned, being the driving force behind two heart-racing moments, the first of which perhaps should have resulted in a goal. This came in the 71st minute when, almost back-to-goal some 30 yards out, he immediately bypassed one opponent with a deft touch, before gaining space from another. Rampaging into the area, he cut across a golden low ball towards Rondón in the centre. However, though a goal looked a near-certainty, whether owing to Zapata’s positioning and/or the West Brom man being out-muscled, the ball was nudged – by either striker, defender or a combination of the two – softly at Ospina, who blocked instinctively with an outstretched leg. This felt like Venezuela’s moment to once again do over their neighbours, who still haven’t won a qualifier in this country since 1996. Two minutes later, Murillo’s second effective contribution occurred when he evaded a challenge to shuffle inside from the left; his ball found fellow substitute Rómulo Otero and somewhat fortuitously ricocheted into space for him to screw a low left-footed effort. It was hit well, but a little too close to Ospina, who will have been relieved to embrace the ball with both arms on the bobbly turf of Deportivo Táchira. Aside from one or two testing balls into the Colombian area, Venezuela were unable to make any more inroads of note, with instead the visitors creating the better attempts before the final whistle. Indeed, in the 77th minute, China-based substitute Giovanni Moreno blasted a blistering 25-yard left-footed strike, which Fariñez did well to parry out to the side. Five minutes later, the goalkeeper spooned a deflected Falcao shot wide and, though he also later awkwardly punched out a cross, when the final whistle blew to proclaim a stalemate, overall this was another impressive performance by the diminutive shot-stopper. He will go down as the man of the match for many and, more generally, Dudamel will be pleased with how well his men frustrated their more fancied opponents, picking up only their second clean sheet of their 15 qualifying games. Although the coach’s future appears precarious owing to a lack of FVF funds, if he can stay in his post for the long haul, this gutsy showing featuring three Under-20 graduates certainly offers him a rather positive platform on which to build. However, in the short-term, he will be a little concerned that skipper Rincón picked up a yellow card in stoppage-time, thus ruling him out of Tuesday’s away match with Argentina. 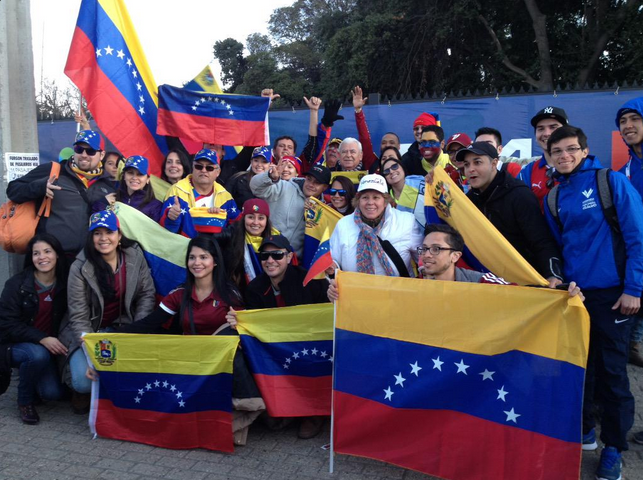 Consequently, when Venezuela go out onto the hallowed turf of El Monumental, they will need all the composure and organisation they can collectively muster. That said, another thwarting of a high-profile qualification-seeker is certainly not out of the question, particularly as Jorge Sampaoli’s 5th-placed men have only scored 15 goals in as many games – two fewer than Dudamel’s darlings. 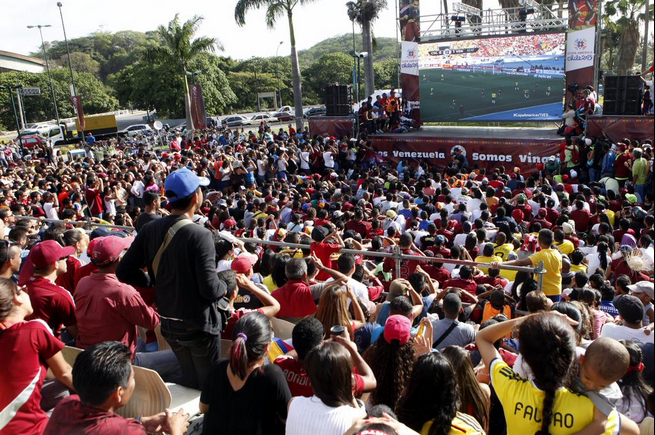 The 16th matchday could scarcely be less decisive for Venezuela, but nevertheless, a considerable test awaits. Venezuela (4-4-2): W. Fariñez; V. García, J. Chancellor, M. Villanueva, R. Feltscher; S. Córdova (A. Figuera, 84′), T. Rincón, Y. Herrera, D. Machís (J. Murillo, 60′); S. Rondón, J. Martínez (R. Otero, 55′). Colombia (4-2-3-1): D. Ospina; S. Arias, C. Zapata, O. Murillo, F. Fabra; C. Sánchez (A. Aguilar, 75′), W. Barrios; J. Cuadrado, E. Cardona (G. Moreno, 63′), Y. Chará (L. Muriel, 80′); R. Falcao. 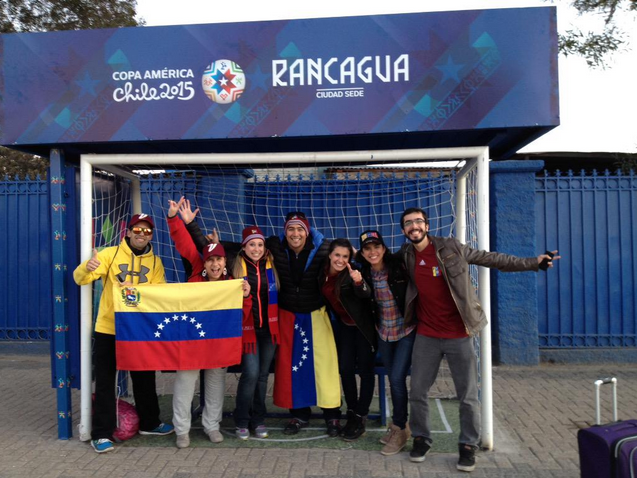 This entry was posted in Venezuela National Team and tagged Colombia, CONMEBOL, CONMEBOL World Cup Qualifiers, Josef Martínez, La Vinotinto, Radamel Falcao, Rafael Dudamel, Russia 2018, Salomón Rondón, South American football, Tomas Rincón, Venezuela, Wuilker Fariñez, Yangel Herrera on September 5, 2017 by hispanospherical.